In the second quarter of the fiscal year ending March 31, 2019, operating revenue was ¥402.6 billion and operating profit was ¥32.2 billion. Both revenue and profit declined mainly due to a decrease in gains on sales of properties, including buildings for investors, in the Urban Development segment and a fall in the number of units sold of condominiums in the Residential segment, and the rate of progress against the full-year plan was around 40% for operating profit. However, this is because sales of buildings for investors and other properties and the delivery of condominiums are concentrated in the second half, and we think that the performance remained steady in line with the full-year forecast. For the fiscal year ending March 31, 2019, both revenue and profit are estimated to increase, with operating revenue, operating profit and profit attributable to owners of parent forecast to be ¥900 billion, ¥80 billion and ¥37 billion, respectively. We have revised only operating revenue upward by ¥20 billion from the initial forecast we announced in May. Operating revenue and profit attributable to owners of parent are estimated to reach record highs. 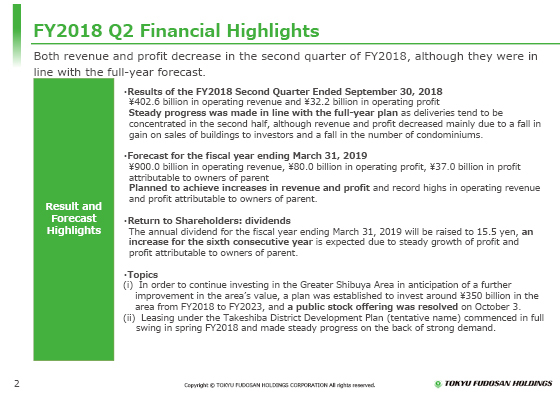 As for return to shareholders, based on our policy of continuing and maintaining stable dividends and keeping the payout ratio at 25% or more, we plan to increase dividends for the sixth consecutive year, with the annual dividend per share rising to ¥15.5. The topics include the setting on October 3 of an investment plan of about ¥350 billion in the Greater Shibuya Area from FY2018 to FY2023 to make continuous investments in the Greater Shibuya Area in anticipation of a further rise in the value of the area. We have decided to increase capital through public stock offering, and the payment was completed on October 29. With respect to the Takeshiba District Development Plan (tentative name) to be opened in FY2020, the Company began leasing in earnest this spring, and it is making steady progress on the back of strong demand, although it is a large office building for the Company.